Flyers give customers easy-to-digest information about your mobile storage business and the services you have to offer. The information should be clear, concise, and useful. If it is not, your flyer will be tossed aside and forgotten. To ensure your flyers go the distance, use the following suggestions when designing and distributing them. Always include a list of your services and prices. This information should stand out so that customers don’t have to search through the flyer to find it. Don’t use ClipArt or other cheap alternatives to good graphics. Invest the money to develop eye-catching artwork and take high-quality photographs of your operations. This will give your business the professional image you want to convey to your customers. Use the colors that are associated with your business and brand image. Don’t be tempted to go with trendy colors that don’t match your business. When choosing colors, use contrast to your advantage by using lighter colors for the background and darker colors for the text. This will help your message stand out within the design. You are creating a flyer, not an essay. One to two paragraphs of text is all you should include on the front side of the flyer. Also, use fonts that are large and easy to read under every lighting condition. Your flyer should always include a call to action at the end. Whether it is to contact you about a limited time offer or to inquire about standard services, the last words on the front of the flyer should always ask readers to contact you. Use the front to advertise your services, and use the back to offer value to your customers. Use that space to offer moving tips, contact information for real estate agencies and other moving related partners, coupons for services, etc. This will help extend your flyer’s lifespan as customers prepare to move and think about the information you provide. Place your contact information at the top of the flyer so that it is easy to see. This creates a bookend with your closing call to action. Psychologically, it will also put customers at ease because they won’t be thinking “How do I contact them?” as they read the flyer and digest the offerings. It’s a simple trick that helps readers focus on the message. Positive words trigger positive responses. Negative words end up in the recycle bin. Use words that will inspire and motivate potential customers to take advantage of your mobile storage services. When choosing your words, be careful not to rush or pressure action. For people who are moving, this can create added stress. Instead, use words that focus on the ways your business makes moving easy, safe, and affordable. There needs to be a clear separation between text boxes, lists, contact information, and graphics. This keeps the flyer from appearing cluttered. It also helps readers focus on specific elements without being distracted. The effectiveness of your flyer depends on your ability to put yourself in your customer’s shoes. If you can think like your customers and speak to their needs, you will earn their business. 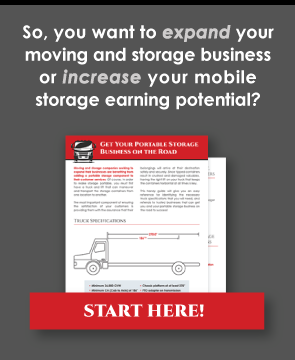 Mobile storage businesses can use flyers to great effect when they follow these tips. When combined, they create a flyer that will get attention and make your business stand out from the competition.